32 feet tall, Verticle Crack, 10 foot roof overhang, 24 routes rated 5.7 - 5.12, and 2 auto belay devices. From Beginners to Experienced Climbers, our wall has a challenge for you. The gym is open to climbers of all ages. All climbers must have a signed liability waiver. Those under 18 must have a parent or legal guardian sign for them. Children 12 and under must wear a helmet and be accompanied by an adult during open gym hours. Y Members may use gear at no cost. *Belay device & carabiner are ONLY available to those who are belay tested in our climbing gym. Test is required for belaying at The Family YMCA Climbing Wall. Participants must be 16 years or older to take the Belay Test (14 -15 must take the On Belay Class). Participants must demonstrate knowledge of proper harness use, knots, tying-in, commands, and proper belay technique according to The Family YMCA standards. Tests may be given by any Climbing Wall staff during Open Climb hours. Instructional climbing classes for youth meet once a week each month September through May (excluding December and holidays). Harness, climbing shoes, and helmet are provided. Fall registration opens Aug 15 for Y Members and Aug 17 for all. Spring registration opens Dec 15 for Y Members and Dec 17 for all. This class will provide students with a safe venue to develop and demonstrate basic top rope belaying and climbing skills. Students will demonstrate an understanding of the following top-rope safety system and skills: harness, figure-8 tie in, top-rope belay with manual or GriGri device, safety, and falling (optional). 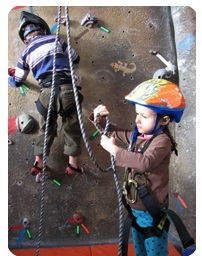 Give your child a birthday party to remember at the Y’s indoor climbing gym. After climbing for 1.5 hours, there will be a half hour of parent-led time for cake, pizza or ice cream and opening presents. Parents provide the food. No previous climbing experience is necessary. Safe, experienced climbers are on staff for the parties. The cost is $120 for rental of the Climbing Wall (includes one staff member). Parties of 16 or more need an additional staff person for $25 extra. Climbers must be at least 4 years old. A $25 deposit is required. More details are available at the Y Front Desk.